Christopher Beeson outside of CTI. Photo by Katie Harris. For Christopher Beeson, his life is centered around one word — empowerment. As an instructional technologist at DELTA, Beeson coaches and empowers faculty through their instructional challenges. 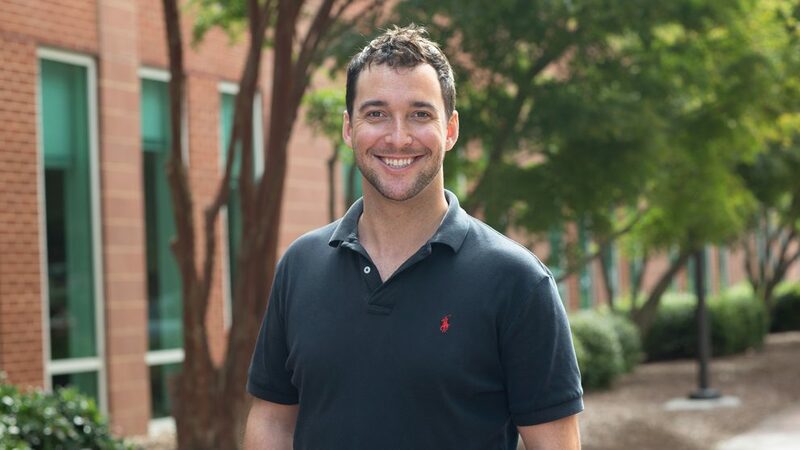 A 2010 graduate of Elon University in special and elementary education, Beeson worked as a church music director in Burlington, North Carolina, as well as a special education teacher and IT director for five years at Woods Charter School in Chapel Hill, North Carolina, before joining DELTA. Christopher and his family at Thanksgiving. In November 2015, Beeson joined DELTA as a part-time instructional designer. 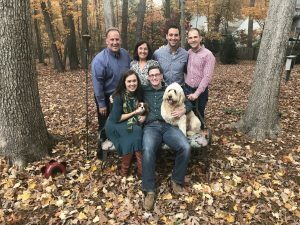 After a conversation with Director of Instructional Support Services Stacy Gant, Beeson knew being an instructional technologist was what he wanted to do. “Instructional technologists here do a little bit of everything. I wanted to be a coach for the professors,” he added. Beeson joined the Instructional Technology Training team full time in April 2016. “When I was in school, I figured I’d be a special education teacher forever, but I was given opportunities to do different things, and I need that variety,” he added. When Beeson began as an instructional technologist at DELTA, he worked mostly on workshops. Now, that has shifted to include a variety of instructional support projects. New this academic year, Beeson is working on two DELTA grants with faculty in special education in the College of Education. Since he has a background in special education, Beeson is excited for these projects. Beeson is also spearheading a collaboration with the Graduate School. “We provide workshops for graduate students who may not otherwise feel comfortable coming to workshops with professors,” he said. Beeson enjoys being able to dive deeper into the pedagogy of certain academic technologies or teaching strategies to help the graduate students become more comfortable teaching. Other projects include leading course design/Moodle gradebook open labs, workshops mostly centered around the creation and use of instructional video, managing the LearnTech YouTube channel, and holding consultations. Beeson also joined the Online Course Improvement Program (OCIP) team this fall for its second cohort. Tell us how you got involved in the Online Course Improvement Program and the new Rapid Design grant. “The YouTube project has been one of my favorites, mostly because I get to watch my colleagues create something they’re proud of,” Beeson said. A goal for the future of the YouTube project is to reach outside of Instructional Support Services to include other staff members in DELTA who can share their expertise. “Quite frankly, I enjoy the people the most,” said Beeson. From those directly on his team to others across DELTA, Beeson enjoys collaborating with everyone. “I also enjoy the people I encounter in my workshops, consultations and across different projects — especially being able to learn so much about different subject matters through those people,” said Beeson. Beeson also loves holding consultations. “I get to sit down and try to problem solve for 90 minutes with someone and hopefully they leave with something,” he added. Consultations are where Beeson is able to empower faculty and coach them through their instructional challenges. 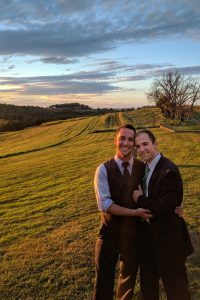 Christopher and Liam at a wedding in West Virginia. “My favorite thing is boating. I always like to be out on the lake. 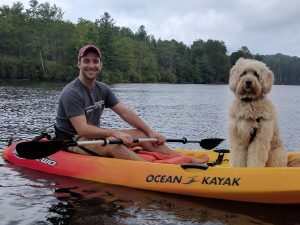 I grew up in the mountains of Tennessee and North Carolina, so I’m used to mountain lakes and being out on the water whenever possible,” said Beeson. He also likes to venture around the mountains and go for drives on winding roads with his partner, Liam, and Goldendoodle, Oliver. Many people may not know Beeson plays and sings at weddings, dinner events, and other gigs. His Valentine’s Day and New Year’s Eve are usually spent playing at a country club in Greensboro. Beeson also enjoys reading about neurobiology. The book Musicophilia: Tales of Music and the Brain inspired him to use music with his students with disabilities to help them increase their attention span. Christopher and Oliver enjoying a day on the lake. 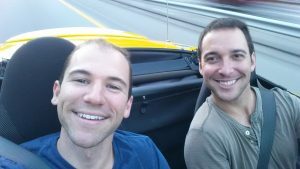 Christopher and Liam traveling on windy mountain roads.